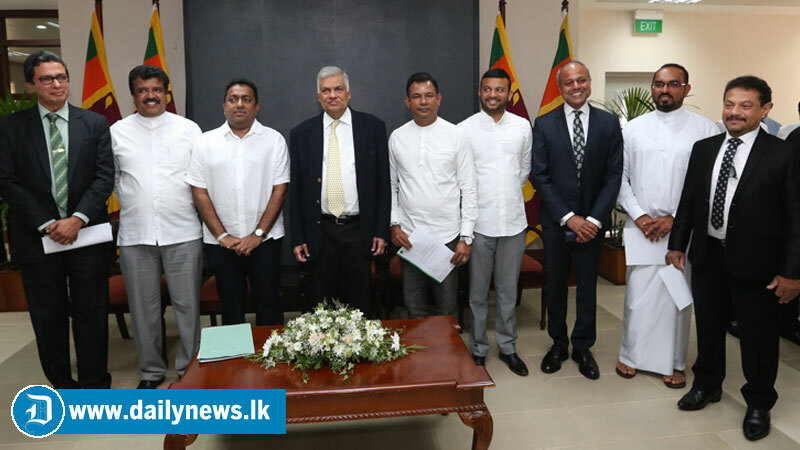 Prime Minister Ranil Wickremesinghe has appointed artiste Rookantha Gunathilake, MP Kavinda Jayawardena, Lalith Dissanayaka, Thilina Bandara Tennakoon, Manjula Bandara and D.M.U.B Wijenayaka as local party organizers of the United National Party. Prime Minister Wickremesinghe handed over the appointment letters to his party’s new organizers at Temple Trees yesterday. Rookantha Gunathilake has been sppointed as the UNP organizer for Dambadeniya, MP Kavinda Jayawardena organizer for Negombo, Lalith Dissanayaka for Aranayaka, Thilina Bandara for Paathadumbara, Manjula Bandara for Wariyapola and D.M.U.B. Wijenayaka for Hiriryala. The Premier said here as with new political alliance come into force as the Democratic National Front with the participation of the constituents in the United National Front and other forces, a free society that will protect democracy and judicial independence will be created. He said the United National Party has arrived at a decision to appoint party leaders for vacant seats in every district, and the new organizers have been appointed accordingly. “We have already launched a programme to secure the participation of political parties and other organizations into forming the Democratic National Front,” he said. He told the new party organizers that the party expects them to fulfill their responsibilities by it. Viharadhipathi of the Sedawatta Purana Viharaya Ven. Ambanwala Gnanaloka Nayaka Thera, monks, religious leaders, Minister Malik Samarawickrema and and UNP Secretary and Minister Akila Viraj Kariyawasam were also present.